U.S. 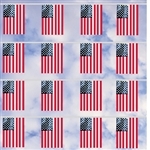 FLAG PVC RECTANGLE BUNTING FLAG STRING - Made of PVC printed two sided or upgrade to the 100ft strand. 50ft Strand printed on coated PVC fabric, each bunting is 8" wide x 12" height, 30 buntings on a 50ft string, distance 12" between each bunting. 100ft Strand printed on coated PVC fabric, each bunting is 8" wide x 12" height, 60 buntings on a 100ft string, distance 12" between each bunting. CUSTOM PVC TRIANGLE BUNTING FLAG STRING - Made of PVC printed two sided or upgrade to the 100ft strand. Single sided or upgrade to double sided. CUSTOM PVC RECTANGLE BUNTING FLAG STRING - Made of PVC printed two sided or upgrade to the 100ft strand. Single sided or upgrade to double sided. CHECKERED RECTANGLE BUNTING FLAG STRING - Made of PVC printed two sided or upgrade to the 100ft strand.